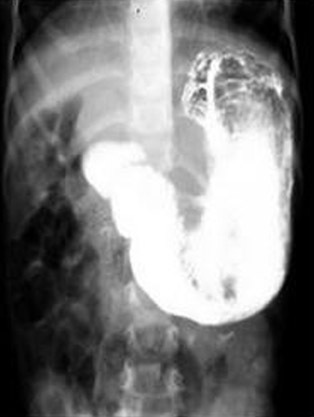 The upper gastrointestinal (GI) barium series revealed a large, mottled, filling defect in the stomach (Figure 1). Ultrasound of the abdomen showed a superficially located broad band of high-amplitude echoes along the anterior wall of the mass, with sharp, clean posterior acoustic shadowing precluding complete evaluation (not shown). 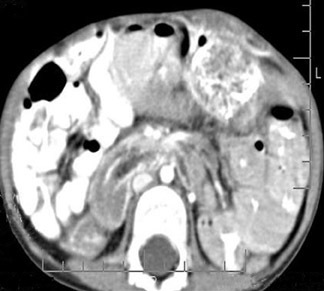 Abdominal computed tomography (CT) was performed to further define the pathology. Noncontrast CT revealed a large, well-circumscribed, inhomogeneous lesion in the lumen of the stomach that was composed of concentric whorls of different densities that had pockets of air enmeshed within it. Oral contrast (2% low-density barium) filled the more peripheral interstices of the lesion, with a thin band of barium circumscribing the lesion. Small collections of barium from a previous upper GI barium study were interspersed within the mass. A peripheral crescent of air could be seen around the nondependent part of the mass. The normal stomach wall could be traced around the lesion. 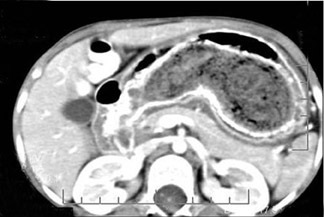 The absence of significant contrast enhancement following the administration of intravenous contrast material precluded a neoplastic lesion (Figure 2). The mass also extended into the duodenum (Figure 3). Endoscopy confirmed the presence of trichobezoar. Gastrotomy revealed the hairball in the stomach. 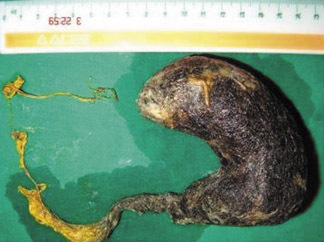 The mass was composed of long hair strands that formed a long tail that extended into the ileum and was removed through the gastrotomy (Figure 4). The term Rapunzel syndrome was coined by Vaughan and associates in 1968, for an unusual manifestation of a trichobezoar in which the mass extends from the stomach and duodenum through a large portion of the small intestine.1 The term bezoar comes from the Arabic badzehr or from the Persian panzer, both meaning counterpoison and antidote.2 Hindus used bezoars in the 12th century BCE for rejuvenating the old, neutralizing snake venom and other poisons, and treating vertigo, epilepsy, melancholia, and even plague. Bezoars mostly originate in the stomach, probably related to a high-fiber diet. They generally cause nonspecific symptoms, such as epigastric pain, dyspepsia, and postprandial fullness. The patient may present with a palpable, firm, nontender epigastric mass, which may be discovered on routine physical examination in an asymptomatic patient or may be an operative surprise. Patients may also present with GI bleeding (6%) and intestinal obstruction or perforation (10%).4,5 Some patients with trichobezoar show overt psychic/mental disturbance or personality maladjustment. Though their presence may be suspected clinically and on ultrasound, trichobezoars are best identified on barium studies and CT.
On ultrasound, the characteristic appearance persists irrespective of the angulation of the transducer, the alteration of position of the patient, or the administration of clear water. This excludes the clinical possibility of a pancreatic pseudocyst, a splenic or renal mass, a noncalcified gastric tumor, a gastric duplication cyst, or a gastric outlet obstruction. However, a heavily calcified mass (such as a teratoma, a neuroblastoma, or an impacted mass of feces) may produce a similar ultrasound image.6 Apart from the mottled filling defect, an upper GI study may show the positive density of the mass with a lacelike pattern due to residual contrast medium on delayed films. The fluoroscopic examination with the patient in the erect position shows the swallowed barium held up in the cardiac end of the stomach for a few seconds, as though it were forming a cap to something inside the organ. Then the contrast can be seen to suddenly diffuse slowly downward on either side of a nonopaque foreign body and follow the regular contours of the greater and lesser curvatures to map out the normal contour of the stomach. The treatment of large bezoars and concretions is essentially surgical. Gastric bezoars may be retrieved endoscopically or via gastrotomy. Duncan et al8 recommended bezoar extraction by multiple enterotomies in cases of Rapunzel syndrome. It is mandatory to do a thorough exploration of the rest of the small intestine and the stomach to look for retained bezoars. Other methods like modified needle-knife (bezotome) and a modified lithotripter (bezotriptor) have also proven very successful. The patient's psychological problems also need to be dealt with. We have described a very rare variety of trichobezoar, the Rapunzel syndrome. Trichobezoars are a bizarre medical problem, and Rapunzel syndrome is an extremely uncommon variety. The diagnosis of trichobezoar is possible on imaging in a proper clinical setting. However, Rapunzel syndrome is most often an intraoperative finding. Though suggested clinically and on ultrasound, trichobezoars are best identified on barium GI studies and CT, through their characteristic imaging appearances. Naik S, Gupta V, Naik S, et al. Rapunzel syndrome reviewed and redefined.Dig Surg. 2007; 24:157-161. Sharma RD, Kotwal S, Chintamani, Bhatnagar D. Trichobezoar obstructing the terminal ileum.Trop Doct.2002;32:99-100. Andrus CH, Ponsky JL. Bezoars: Classification, pathophysiology, and treatment. Am J Gastroenterol.1988;83:476-478. Goldstein SS, Lewis JH, Rothstein R. Intestinal obstruction due to bezoars. Am J Gastroenterol.1984;79:313-318. Senapati MK, Subramanian S. Rapunzel syndrome.Trop Doct.1997;27:53-54. Kaushik NK, Sharma YP, Negi A, Jaswal A. Images-Gastric trichobezoar.Indian J Radiol Imaging.1999;9:137-139. Morris B, Shah ZK, Shah P. An intragastric trichobezoar: Computerised tomographic appearance. J Postgrad Med. 2000;46:94-95. Duncan ND, Aitken R, Venugopal S, et al. The Rapunzel syndrome. Report of a case and review of the literature. West Indian Med J.1994;43:63-65. Rapunzel syndrome: A trichobezoar extending into the ileum. Appl Radiol.